Here are common questions we get from customers. We have answered each. If you have additional questions, please use the form above to email your question to us. We will respond as soon as possible. Q: I have a friend that did his own floor and it is peeling up in several places. What makes your product better than what he used? A: Your friend more than likely used a "kit" from a big box store or paint store. These kits are cheap, they have been made and chemically created to make the application process easy and simple. They are cheap because the substances and mixtures are inferior to the industrial epoxy mixture we use. These kits are little more than Epoxy paint that goes down at room temperature. Our product is a chemically mixed resin, mixed on site, that goes down extremely hot. The key to our extremely floor durability is the time, energy, and effort we put into the "prep" stage. Our “5-Step" process is not easy because we grind every square inch of your floor surface to insure that we get a bond and adhesion worthy of a "Lifetime Warranty". Q: I had a company install epoxy on my garage floor 4 years ago and it is peeling, flaking, and coming up. How do I know that your company can install a better floor than those guys did? A: Chances are high that the company that installed your floor has disappeared. They are no longer in the business! There are many painters that go the the local paint store, buy the epoxy floor kit, and claim to be an epoxy flooring installation company. They most likely used acid chemicals to acid etch and "rough" the surface to prep your floor. I can tell you we are going on our 7th year in the epoxy flooring business. We have a A+ Better Business Bureau rating, we area members of the Huntsville/Madison Chamber of Commerce, the Great Birmingham Area Chamber and the Chattanooga Chamber of Commerce. We have installed big and small floors including work at car dealerships, church fellowship halls, chicken food processing plants, Frito-Lay Manufacturing facility, driveways, patios, porches, and 1 to 7 car garages all over Central and North Alabama and the Chattanooga Area. 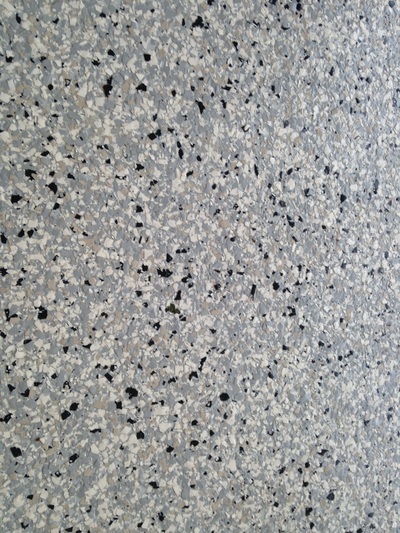 In fact we are proud to say we have done floor work for the Von Braun Convention Center in Huntsville. You do not stay in business for 6 years and have this type of clientele we have without doing top quality work and having a great reputation for doing so! We will do the same for you. Q: A Lifetime Warranty sounds too good to be true. Is that practical? Is that possible? A: If you owned a restaurant, your warranty would be 3 to 5 years. If you own a car dealership or oil change facility, the warranty would be 3 years. But, we feel very comfortable with providing residential clients a "Lifetime Warranty" for normal home use and wear and tear. The warranty does not cover damage caused by acetone, battery acid, or damage caused by dragging a heavy object across the surface such as heavy freezer. 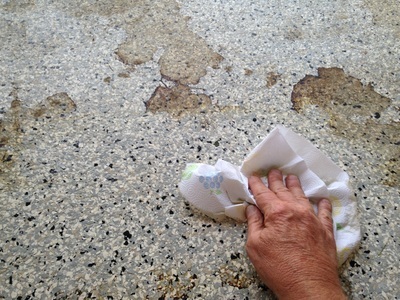 Oil and petroleum products will not permanently stain your floor. Shown here is an accumulation of nasty, ugly, oil stains that dripped out of a riding lawnmower while it was parked in the garage during the winter months. The homeowner used "Mean Green" cleaning solution to remove the stain. It took a couple of minutes and a little effort, but the stains were completely cleaned off the surface and the floor looked great again. Q: Why choose 100% EPOXY over other floor coatings? 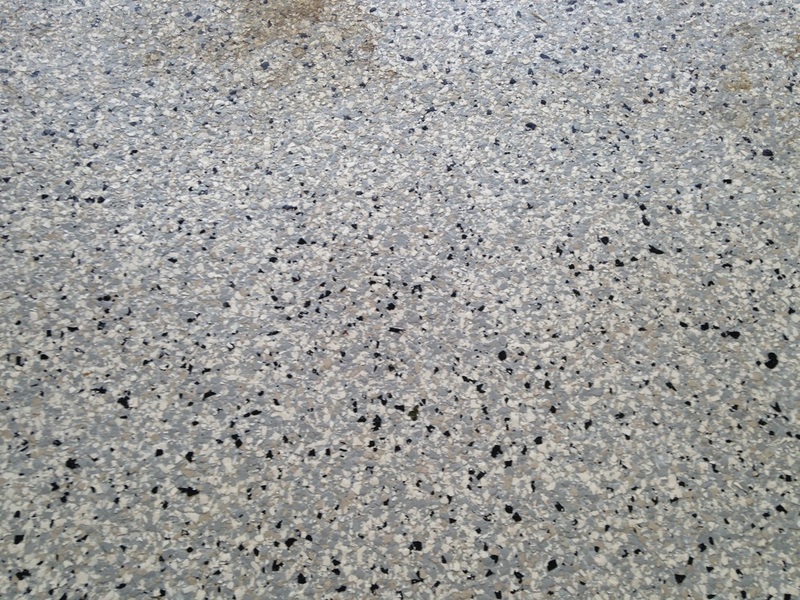 A: Our 100% EPOXY is an excellent concrete protectant. It has the ability to resist most harsh chemicals and slow down the deterioration process that concrete surfaces typically undergo. 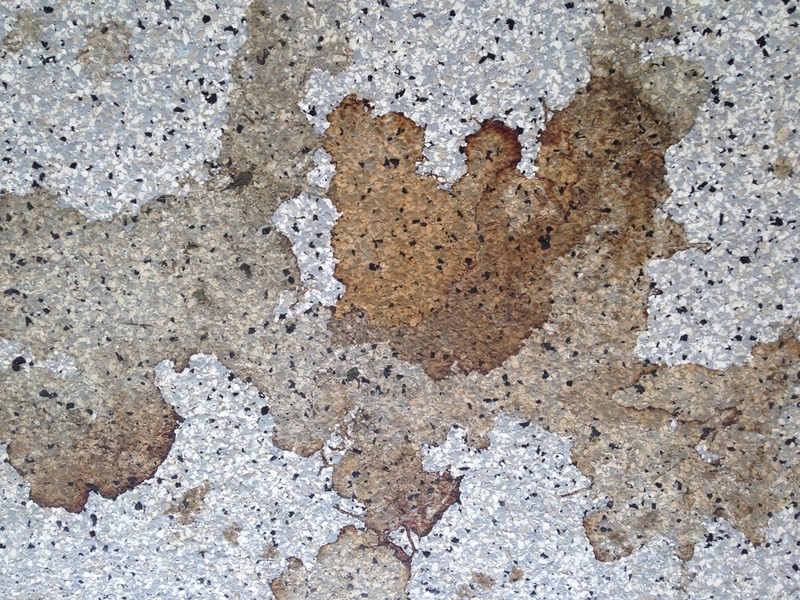 Over time concrete surfaces will break down causing cracks, chips and divots. Our professionally applied EPOXY coating will hinder this break down and keep your concrete floor looking new for many years to come. Q: What should I do before the installation process begins? A: Make sure your floor surface is completely clear of all objects. Do not worry about seeping or cleaning the surface, we will take care of that during the mechanical grinding and prep stag of application. A: Typically it takes 1 day to complete a job. Our crew normally arrives at 7:00 PM and starts working immediately. On most jobs, we are done by 4:00 to 5:00 PM. Q: How long will the floor take to dry? A: It typically 8-24 hours for our EPOXY to dry. There are a few factors that will determine the dry time most commonly temperature and humidity. In most cases you can walk on the surface in 8 hours and drive on it in 24 hours. Q: How thick is the floor I am buying? A: Your floor thickness will be relative to the depth of the opened air capillaries we open during the high speed grinding process. The chemical we pour our and spread will seep into and fill those cavities. Some places the floor may seep 1/32 of an inch into your existing concrete, some places, 1/16, so the thickness of the new floor coating will vary as the chemical seep into the varying capillaries. This is the key to creating a solid state floor that becomes "one" with the cement surface thus creating a new epoxy floor surface that have no "peeling" properties at all! Therefore it will not peel, flake, crack, or show hot tire marks. 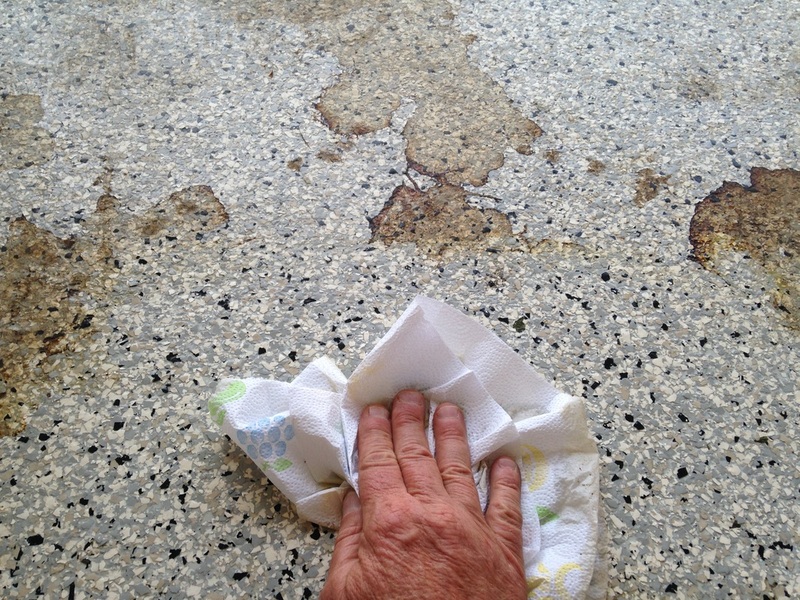 Q: Why do I need an EPOXY sealer on my garage floor? A: Unprotected concrete floors will wear, be stained by oils, fluids, and be damaged by the corrosive effects of chemicals such as oil. 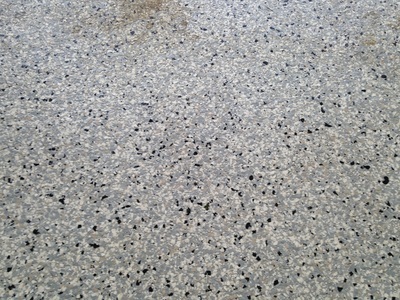 EPOXY floor coating protects concrete from wear because it is actually harder and more durable than the concrete itself. EPOXY is so dense that oils and fluids cannot penetrate its surface to soak in and cause staining. 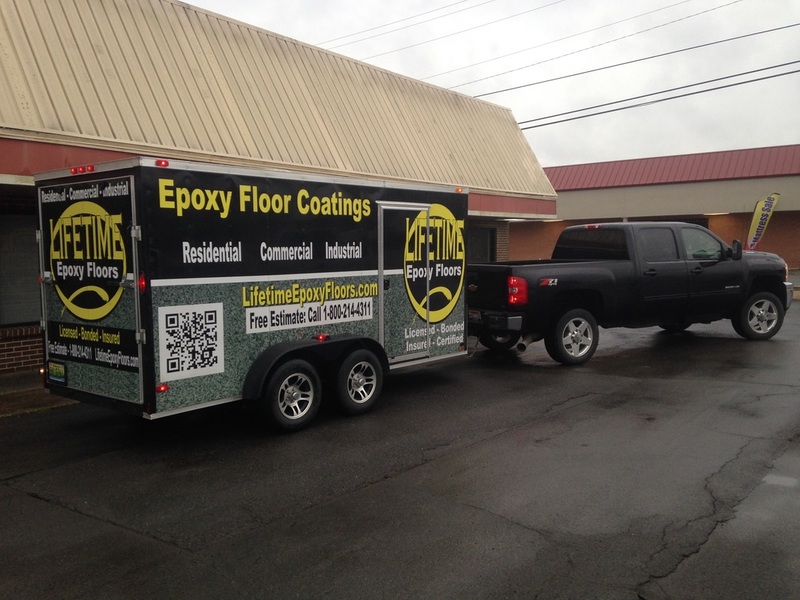 Q: What is EPOXY and why is it better than other floor sealing products? 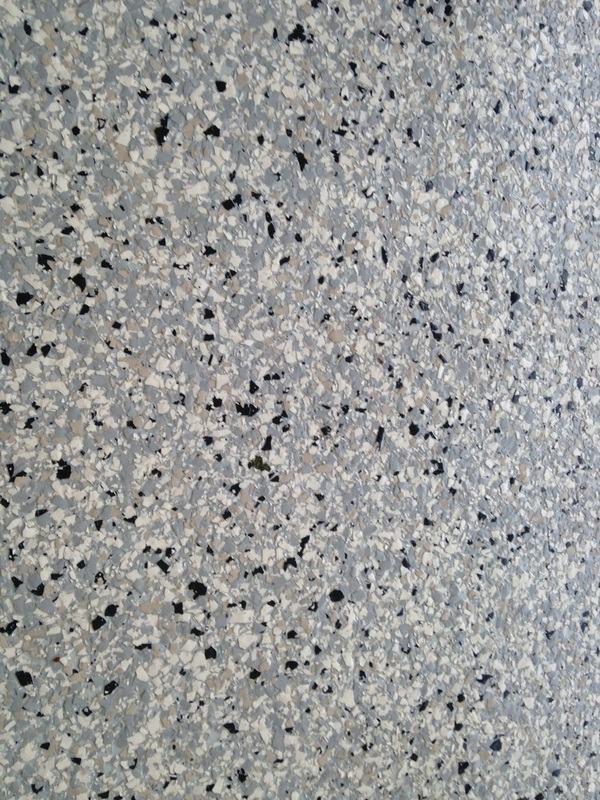 A: EPOXY is a two-component product that when mixed together forms a high performance 100% solids EPOXY floor sealer. EPOXY is superior to paints and other coatings because epoxies form a harder, denser, more durable film than either paint or urethane based coatings. EPOXY can be superior to other epoxies as well since not all epoxies are created equal. Q: What does 100% solids mean anyway? A: 100% solids EPOXY refers to the volume and the total percentage of solids in your coating. EPOXY is not diluted with a water or a solvent base, it is 100% solids. This gives you a very durable coating, because unlike a water base product, here there is no product shrinkage. You are getting the best in terms of adhesion and durability with the EPOXY system. Q: Does EPOXY give off any harmful vapors or odors and is it safe for indoor use as in homes and businesses? Q: How long should I wait to have EPOXY applied onto newly poured concrete? A: We recommend you wait at least 30 to 90 days to have EPOXY applied to a newly poured concrete, depending on the application and moisture. 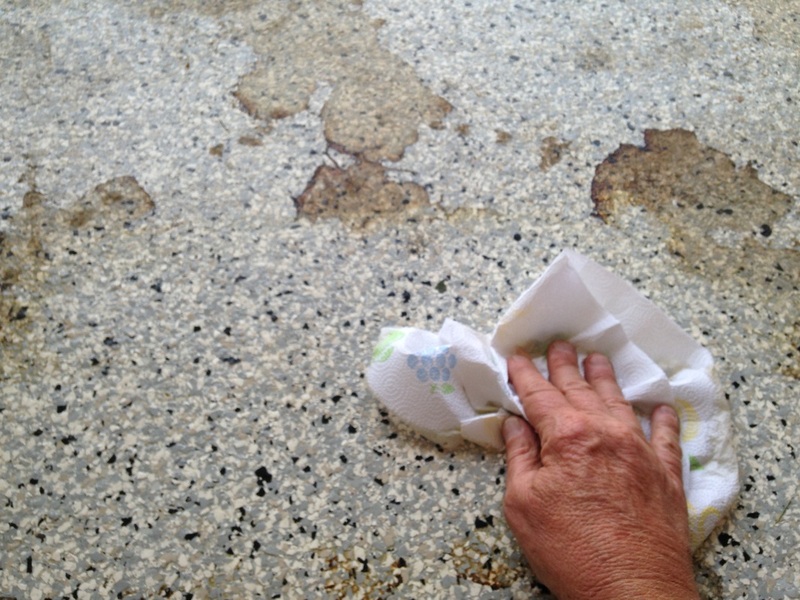 Q: Why does the floor surface have to be prepared before applying EPOXY? A: Floor preparation is crucial to the proper application of EPOXY. The EPOXY floor coating system will not be able to penetrate and bond to concrete in areas where oil or fluid contamination has occurred. 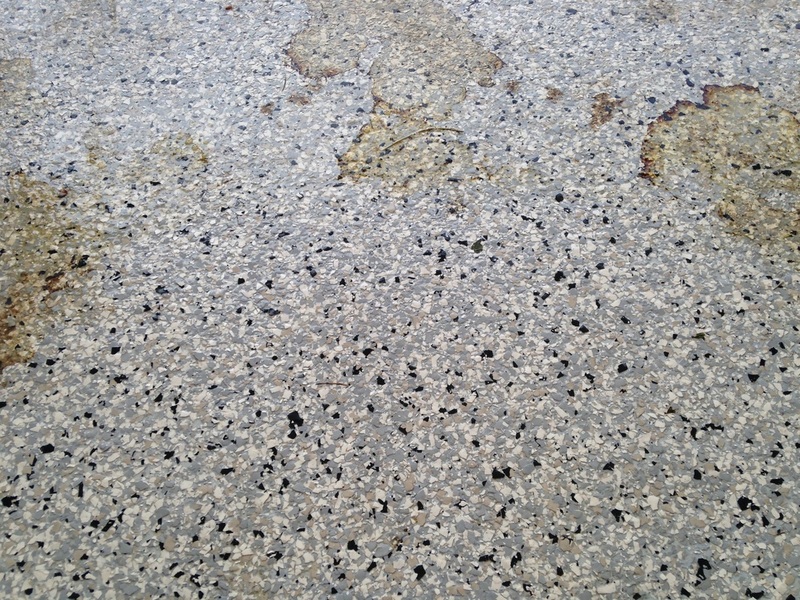 A spalled or worn floor may have loose mortar and/or an insufficient profile to assure proper EPOXY bonding. We use high tech machinery to grind the surface of the concrete which removes many of the contaminants and also provides a suitable profile of the concrete floor. A: Yes. Areas that are not properly prepared will have bonding issues which may cause the EPOXY to lift or peel. 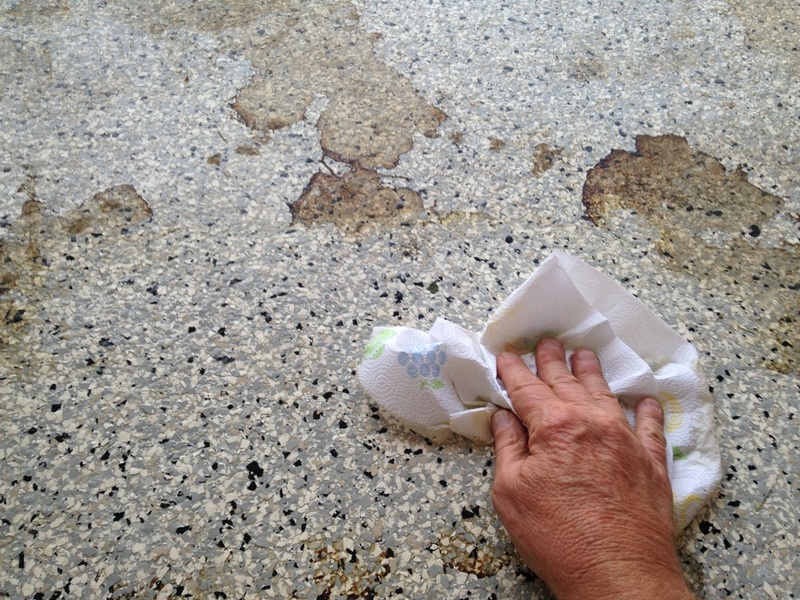 It is vital that your substrate have a rough, clean surface for the EPOXY to adhere to. The prep work is the most important part of the entire application process, although very labor intensive, we feel it is a very important step that cannot be overlooked. It is included in the price as well since it is part of our total EPOXY coating system. Q: Why do you go the extra step of using a floor machine to prepare my floor instead of simply using the acid etching Prep and Cleaning Solutions commonly included in the do-it-yourself kits? A: Profiling your floor with a carbide diamond grinder will create a machine etch by removing a fine layer of laitance from the concrete substrate and create better adhesion of the EPOXY to the substrate by removing any contaminants that may be trapped on the floors surface. We will also not have to wash the floor and wait for it to fully dry. We simply vacuum the floor after it is machine profiled and it will be ready to coat. Q: What do you do about the cracks and holes on my concrete prior to applying the EPOXY coating? A: Our product is self-leveling and may fill some imperfections, but we always recommend to fill cracks and holes as much as possible prior to applying our product. The result will be a flawless floor. We have a system to repair the damage. Our method will fill in and repair minor cracks, holes, and depressions. 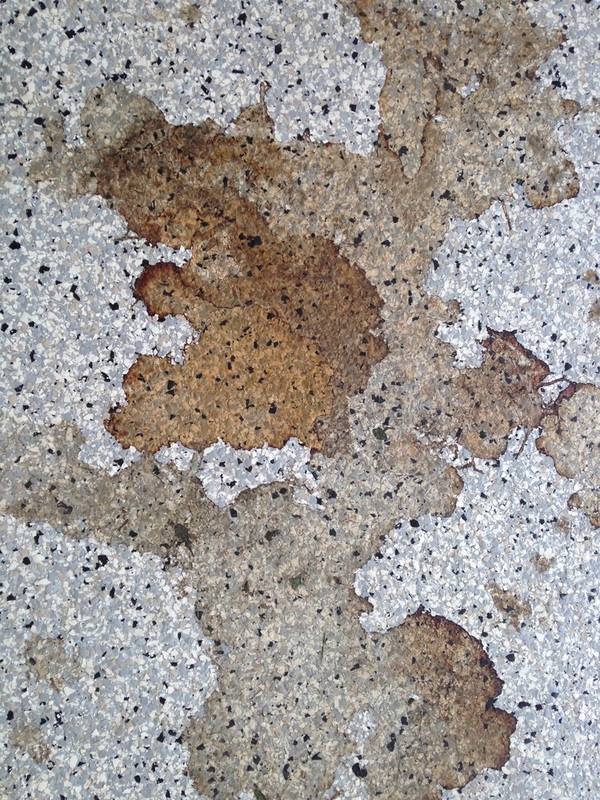 We apply a 100% solids EPOXY resin base, a catalyst hardener, and a special aggregate to make it a highly durable patching system for concrete. Q: Can I put EPOXY over pre-existing paints or other coatings? A: EPOXY is not recommended for application over existing coatings because the existing coating will inhibit bonding of EPOXY to the concrete floor. Floors that have existing coatings should be stripped, diamond grinded or shot blasted to remove as much of the coating as possible. 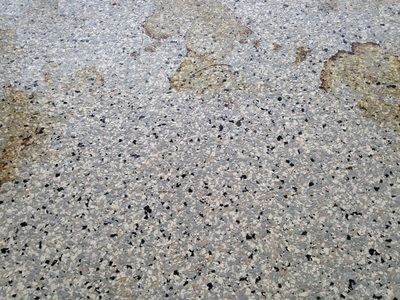 Q: What is the purpose of the EPOXY decorative flakes? A: The decorative flakes serves to enhance the appearance of the surface. The color combination chosen usually complements the EPOXY color for a polished and eye-catching look. It also provides an additional protective layer over the EPOXY which enhances the strength of the concrete floor as well as adding to its slip resistance. A: Yes, EPOXY can scratch if heavy objects are dragged across its surface, however, under normal conditions, EPOXY should not scratch. Q: Do I have to recoat with EPOXY every year? A: No, since our EPOXY is 100% solid industrial strength and of the highest grade, it results in a hard, durable surface which will last for many years under normal circumstances. Q: What will hot tires do to our EPOXY? A: Tires heated from normal driving will not affect the performance of our EPOXY. 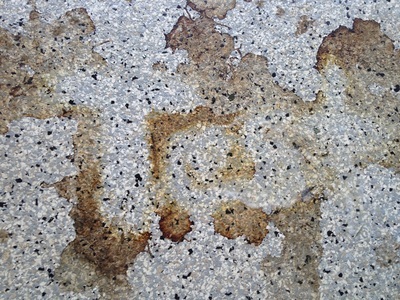 Q: What will sunlight do to our EPOXY? 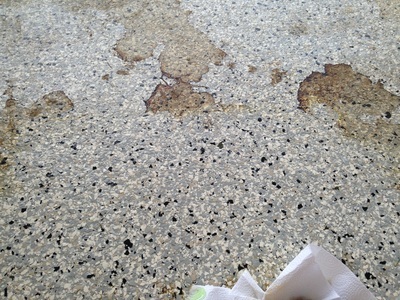 A: Our EPOXY although resistant to sunlight has its limitations. If you have an area you want EPOXY applied to that is under direct sunlight then a higher UV protectant is applied.